Energy body (or aura) has 7 main layers, each of them relating to the physical, mental, emotional and spiritual condition of man. These aura layers transmit information between the body (through the chakra system) and the immediate external environment. The layers have an ovoid shape and are arranged one inside the other. Each layer or level is an energy field varying in vibration. The outer layers are larger and with higher vibration. As with the chakra system, there are many more layers (over 50), but they are not important to us while we are in the physical life. Each layer of aura corresponds to one chakra. 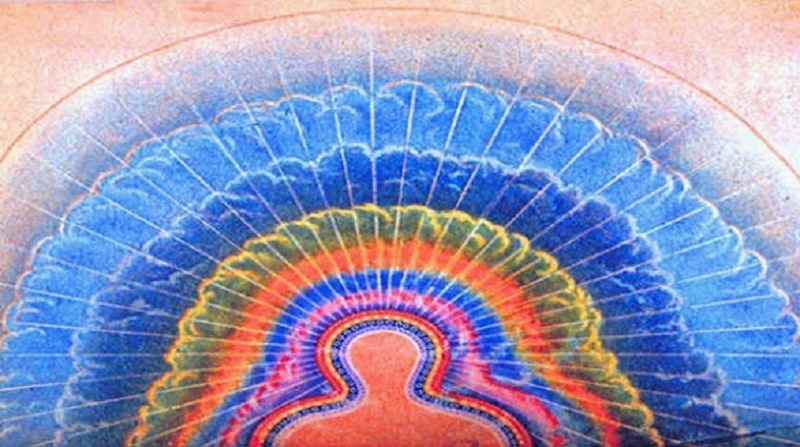 The etheric body is the first layer of the aura after the physical body and can be seen as a bridge between the physical body and subtle bodies. Connected with First Chakra (Root). Since it is the closest to the physical body, it is the densest, but at a higher vibrational level than the physical body. Etheric body gives vitality and organization to the physical body. It transmits energies of the higher bodies down to our physical consciousness. This is the layer that corresponds to the physical life, feelings, physical pleasure and pain, and physical health and wellbeing. Etheric body copies the form of the physical body and extends 1 to 5 cm around it. It vibrates at a frequency of 15-20 cycles per second. Its shape is composed of a plurality of power channels, called meridians. These channels form a network on which rests the tissues of the physical body. Restrict any material is seen as a cavity in the etheric body. Something like-negative image of the physical body. This grid is primary and appears before the physical body. It is like a template, in which cells grow on the physical body. The etheric body is in constant motion. Its color can vary from whitish blue to dark blue. The lighter color means thinner ethereal layer. In weak and sensitive people is light blue, with a gross personality is rather gray. This layer is invisible to most people, although this is the first thing you see when you start to practice viewing the aura. Awareness of the etheric body is achieved by practices such as pranayama, tai chi, chi kung, Taoist yoga, or simply concentrate the mind on the idea of energy. Respond to red and note “c” and belongs to the physical plane of existence. The emotional body is the second layer of aura, which vibrates the frequency of emotions and feelings and affects emotional balance as a whole. It is connected with the second chakra – sacral. Emotional body gives the opportunity to have desires, emotions, imagination and psychic abilities. It gives strength, which is essential for effective action and manifestation in life. Although only extends from two to five centimeters from the physical body, it copies the shape of the physical body. Emotional body looks like a soft colored clouds of fine substance in constant motion, which express the full range of our emotions. These clouds change color to changes in emotions, so they describe transmitted domestic sentiment. All colors of the rainbow can be seen here. It shows dark spots or muddy and frozen areas, places where there are emotional blockages and emotional disorders. It is more difficult to see this layer of aura, but with practice it is possible. Feelings of emotional body include a full range of emotions – fear, hatred and grief to love, happiness and ecstasy. They also include the full range of completely selfish and destructive desires to high spiritual aspiration and desire for selfless help. Emotional consciousness wakes up mainly by stimulating desire. React to orange and note “d” and belongs to the physical plane of existence. Thank you. Exactly what I was going to say. Completely taken from Brennan’s book – including images. Should reference the source material.